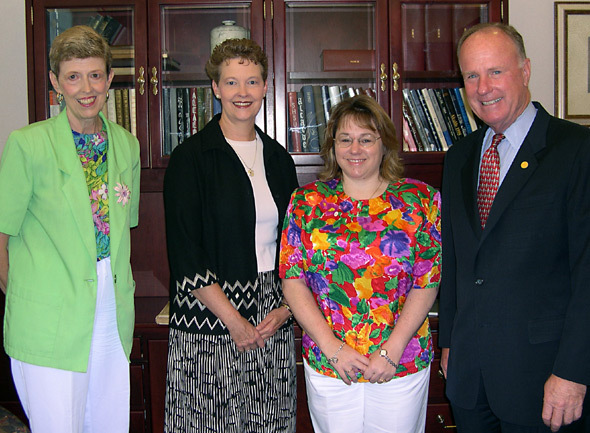 James F. Gaertner, right, SHSU president, congratulates staff excellence award winners for 2005. They are, from left, Shirley Miller, Debra Kleppelid and Sherry Hirsch. Proving that education at Sam Houston State University is not limited to the classroom, the three employees selected for the university's 2005 Staff Excellence Award are all commended for their contributions to students...and none of the recipients are teachers. The three are Sherry Hirsch of the College of Education, Debra Kleppelid of Physical Plant, and Shirley Miller of Undergraduate Admissions. The Staff Excellence Award is given annually to three university employees who excel in their job duties. They are selected based on nominations by their peers, supervisors and members of the SHSU faculty. In addition to a plaque of recognition, each recipient is traditionally honored during a general university meeting at the beginning of the fall semester and awarded a $2,000 bonus. Sherry Hirsch is the administrative assistant in the dean's office of the College of Education. She has been employed at the university since September 1999. "I love all the students I work with and consider them my family," she said. "I try to put myself in their shoes when they have questions, and I believe that working with them in a positive way helps to create a good relationship between them and the university." She credits College of Education Dean Genevieve Brown with being a great motivator as well. "I work in a wonderful department and I love to come to work every day," she said. "SHSU students are lucky to have someone like Sherry working on their side," wrote one co-worker when nominating Hirsch for the honor. "I have seen her work with undergraduate students, master's students, and doctoral students, and you can tell how much they appreciate her warmth and hard work. She always tries to give students the best help possible." "She is constantly thinking of ways to make the College of Education look good, which reflects on the entire university," wrote another co-worker. "This is especially important as Mrs. Hirsch's responsibilities include all events, activities, alumni communications, and recognition events sponsored by the college." "She supervised over 19 student assistants in our department," wrote another. "Sherry, while working with student assistants, helped them with time management skills, academic encouragement, office skills training, and sometimes even personal counseling. She always dropped everything to help students…"
"Not everyone has the ability to perform as many simultaneous duties as Sherry does and still sustain a high degree of efficiency," wrote another. "If Sherry says that she will do a task, it will be completed well." "Ms. Hirsch is the ultimate role model for staff leadership," wrote another. Debra Kleppelid is a secretary II in Physical Plant, Facilities and Construction. She has been employed at Sam Houston State since October 1998. Her first job at SHSU was in the Custodial and Grounds Department. "I enjoyed working in that department because we were responsible for presenting the first impression students had when visiting our campus," she said. "And now that I work with facilities and planning, it is so exciting to watch the construction of new buildings and see how the vision for the university is coming to fruition," she said. "It's wonderful to be a part of the process of providing more classrooms for our students and to see how we've moved into the 21st century," she said. "She works well with everyone and keeps everything moving in the proper direction," wrote a co-worker. "She always comes to work with a smile and keeps it all day." "Debbie's overall job performance has been excellent in all areas, including quantity and quality of work, work ethic, efficiency, attitude and motivation," wrote John McCroskey, assistant director for facilities and construction. "Most of all she is a true team player." "She supervises student workers and teaches them what needs to be done with a patient and caring attitude," wrote one co-worker. "She is a good role model for them." "She deals with a variety of customers---architects, contractors, university personnel. She is professional and a great representative of our university," wrote a co-worker. "Because of her ability to prioritize," the co-worker continued, "Debbie has been able to take on an extraordinary amount of work. The construction on campus has been at a fast growing pace, and she has been able to meet very demanding deadlines. "The facilities and construction area of the Physical Plant would have had great difficulty keeping up with the vast amount of work created by the increased project load if it wasn't for Debbie's dedication to the job." Shirley Miller is a secretary III in the Undergraduate Admissions office. She came to work at Sam Houston State in December 1994. "When I first came to Sam Houston, I thought it was the most wonderful place I'd ever been," she said. "I love the feeling of 'community' on campus, and I love working with the people in my department." She also enjoys being able to provide customer service through her office, as well as the fast pace that comes with her responsibilities. "I enjoy working with students and parents who have questions about the university," she said. "She is a true student advocate as well as trying her best to keep our entire staff 'armed' with all the supplies and equipment that we need to do our jobs," wrote Joey Chandler, director of undergraduate admissions. "She truly enjoys assisting students, prospective students, parents and all who need help," Chandler continued. "She exhibits outstanding patience," wrote a co-worker. "Working with Ph.D.s is far different than working with irate parents whose child was denied admission," he continued. "Yet her superb phone manner enables her to always be professional." "Each prospective student who is helped by Shirley Miller quickly realizes her desire to help," wrote another co-worker. "She has led many students through the application process with her ready smile and her strong willingness to assist them. She is the heart of the admissions office." "She spends hours of her day responding to hundreds of students by phone and e-mail," wrote another. "I have often heard her encouraging students not to give up on becoming a college student."